Many say that great sausages are bested enjoyed simply, but these recipes from Meica offer great ideas to add to your portfolio of sausage meals. Variation of a classic potato salad with blue cheese and marinated sun-dried tomatoes. 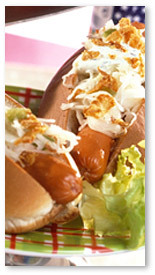 Hot dog with coleslaw and crème fraîche – a quick and convenient lunch. The Far East variation of an old German favorite, with mixed Asian vegetables and sour cream. A big hit for parties with a very distinctive style: hot dog with chilli,beans sweetcorn and bacon. For cowboys or those who want to be. Tasty Mini Wini toast with cream cheese and bell peppers! Scarily delicious: a quick, easy and relative low calorie treat for young and old! A little imagination to turn little gourmets into big chefs.